Our eldest is lion obsessed. And I mean obsessed. As we don’t live in Clacton, Essex, the best place for us to go on a lion hunt in London (aside from the London Zoo, which I highly recommend) seemed to be Trafalgar Square! Unfortunately the lions are currently surrounded by temporary barriers from the Olympics, but you can still get a look at them. The main place we were hunting lions, and other wild animals, was the National Gallery. The nice man at the information desk did some searches and told me the room numbers where paintings containing images of lions, tigers, rhinos and horses were. In case it helps, the animals are in rooms 45 (tiger), 34 (horse, deer and cows), 39 (rhino, but also lots of fruit), 14 (donkey), 29 (leopard), 54 (lion)and 57 (two lions!). There are, of course, other animals in paintings, but these were the ones that stood out. My biggest darling loved it, and the pink cupcake she had in the cafe afterwards, and, so, I mention it in case it appeals to you. And if you know something similarly fun to do with very small children in central London, please do let me know! 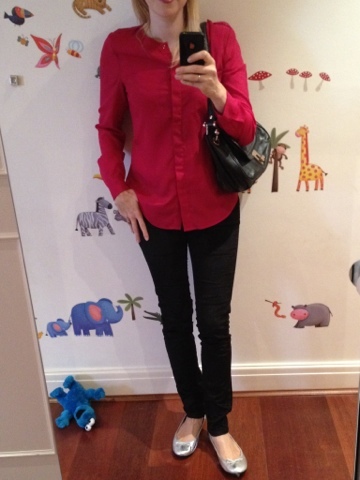 For our lion hunt I wore a shocking pink Oasis shirt, black skinny Mango cords and silver leather London Rebel ballets. With a bright Loreal pink lipstick, which is a bit different for me, but a shock of pink does one good from time to time, I think! The lighting doesn’t really show the black cords, so I have included another picture, as they have a lovely sheen. And since I am talking shocking pink, look at my beautiful new shocking pink heels – they are so fabulous, I can’t wait to wear them! They are the Callahan style from Jones the Bootmaker, reduced to £39. This entry was posted in Children, Jones the Bootmaker, London Rebel, Loreal, mango, National Gallery, Oasis, Outfits, Tiger and tagged Jones the Bootmaker, London Rebel, Loreal, Mango, National Gallery, Oasis on August 28, 2012 by Belinda WornOut.